Sleeping With The Pastor: What are You Leaving Behind? When I ask the question, "What are you leaving behind?" I am not referring to your last will and testament. I am talking about when you enter a room, a conversation, do you leave people in better spirits or worse? I believe that our words are powerful. Think about when someone said something encouraging to you, it lifted your spirits, didn't it? On the other hand, when someone has said something hurtful, it could leave a mark for some time. Being one of six children, I was always fighting to be heard. I have always loved to talk. My friends have always known that something is wrong when I am quiet! During family dinners growing up, my parents always told me to "practice the art of silence." This one never really stuck. Due to my gift of gab, I have often said things without thinking. For example, when my sister-in-law had her very first baby, I went to visit her in the hospital. Her baby looked like all newborns, bald and squishy, but to the mother, she was beautiful. Well, trying to help, I told here that when Elyse turns about 9 months old and gets some hair, she will just be the cutest thing! What was I thinking?!? Well, it is one thing to think this way, but a whole other thing to actually let those words come out of my mouth. 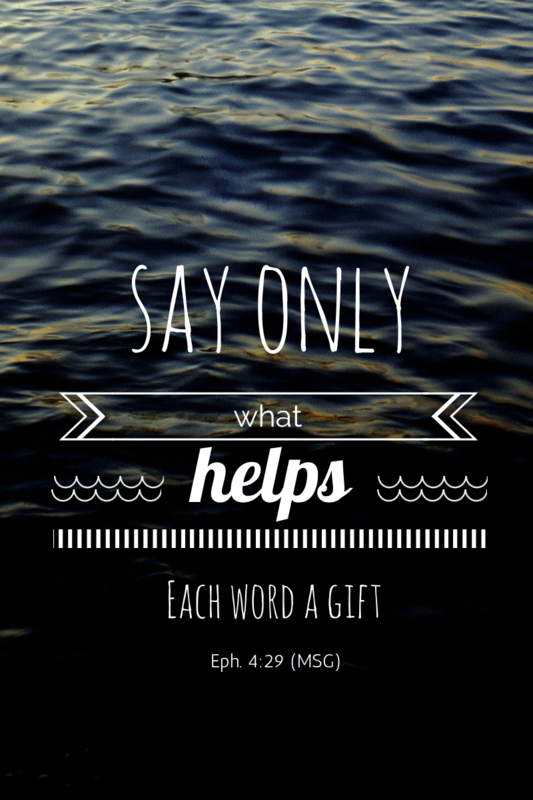 One day, I came across Ephesians 4:29 in the Message paraphrase, it says "say only what helps, each word a gift." Whoa, this verse hit me right between the eyes. I know that the only way I can do this is through the help of the Holy Spirit. I am constantly asking God to help make every word that comes from my mouth a gift. I hope that after people spend time with me they leave encouraged, hopeful and just better off. What mark do you want to leave on people? Let's be very aware of the words that we are speaking over each other.